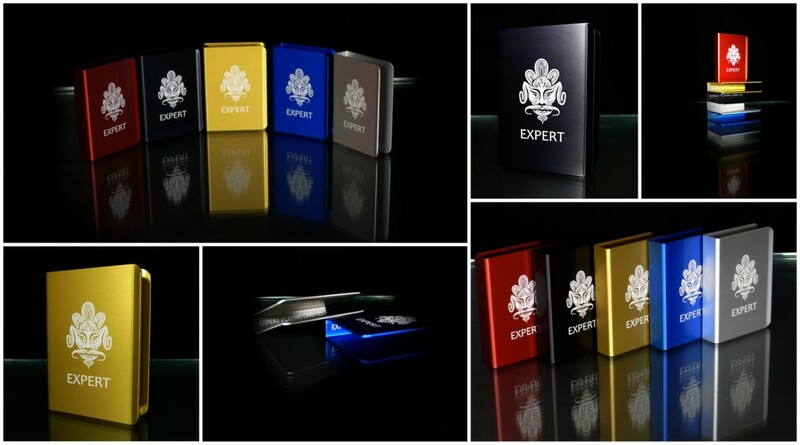 The Expert Playing Card Company® introduces its first Porper Clip! These beautiful clips are custom sized, anodized in 5 stunning colors and engraved both inside and out. Conjuring Arts has previously produced some truly stunning clips with Joe Porper. After a few years off we have decided to create a new classic Expert clip. Only ten of each color (Black, Gold, Silver, Red, and Blue) are available for sale. These extraordinary clips are strong and light and will protect your deck from warping. By keeping your decks flat and uniform, they will be ready for perfect handling. Additionally, the clip will keep your box from getting completely squashed when not in use! These amazing clips are engineered for 54 cards of Master Finish (also works with retail USPCC stocks like Bicycle and Tally-Ho). Classic and Damask finish cards might be a little tight for this one, but fit great without jokers.